All the real time data you need to forecast the best fishing times for saltwater locations in states and territories of the U.S., streamlined and organized into one page for quick-view access. Weather, air and water temperature, tides, wind direction and speed, wave height, and more! 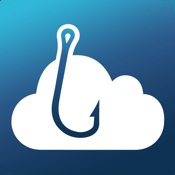 An app created by guys that love fishing, we need your help - Get in on the initial launch and send us your feedback, suggestions, and recommendations so we can continue to improve the app through subsequent updates! In the works: fish identification, bag and size limits, customized alerts. Tight lines!